The European Junior Championships 2011 in Spain will turn out to be a very special trip for athletes and staff of the six participating nations. 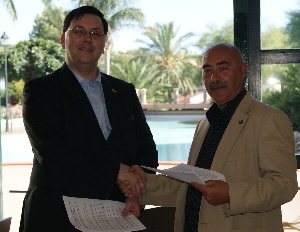 Not only will the teams compete to determine the 11th European champion of junior age level at Salou/Tarragona from August 28 to September 3, but their trip to Spain will provide some more adventurous experiences, as EFAF and the Local Organizing Committee have partnered up with the PortAventura theme park to arrange for accommodation at the park's hotels during the event. That might require some extra efforts from coaching staffs to keep their players focused on the games and the tournament. On the other hand: The prospects of possible victory parties in the splendid environment of a Mediterranean theme park hotel surely should enhance practice efforts all over Europe in the junior age group during the upcoming months. During the tournament players and staff will have access to the amusement park, the beach club, the Aquatic park and the other facilities of PortAventura for the whole time of their stay. Special cost-reduced packages for player's families will be available as well, the whole arrangement is deemed to be a reward for the best young American Football players from all over Europe. Qualification rounds for the tournament are already on their way, Serbia won the tournament of the preliminary round this year and now will have the chance to face France in a game for one of the final tournament spots. Other games scheduled for spring 2011 are Denmark vs. Finland and Austria vs. Russia, the latter one scheduled for April 24 at Vienna. The hosts from Spain, reigning European Junior champions from Germany and Sweden, the other finalist of 2008, will join the three winners of the qualification games in the final tournament. With the EJC 2011 scheduled for the end of August 2011 the tournament date has been moved to late summer, mainly because the IFAF World Cup for senior national teams next year will be played in early summer in Austria. But of course the later date will also help to avoid the hot summer days in Spain, although at last EJC at Sevilla the teams did not report any problems with the climate. But games had to be played in the morning or evening hours, at Salou/Tarragona a more flexible scheduling of games and practices will be possible.